While the competition for investment continues to grow both domestically and abroad, Arizona is leading the nation in attracting businesses that are driving innovation and job creation. Arizona’s success is the result of a combined effort to build a more diverse, innovative and collaborative economy supported by the vision and leadership of Governor Doug Ducey. In addition, Arizona has been among the most effective states in leveraging its proximity and strong relationships with Mexico. Just last month, Governor Ducey announced the launch of SkyBridge Arizona at the Phoenix-Mesa Gateway Airport. The SkyBridge project is a game-changer for Arizona that will result in 17,000 direct and indirect jobs and $230-million investment in infrastructure. This project offers e-commerce companies access to millions of consumers in Mexico and South America, while providing an efficient alternative to our busy land ports of entry. In other sectors, companies like Nikola and TuSimple are revolutionizing the trucking industry, bringing innovative technologies that will offer efficient and environmentally responsible practices to supply chains - and they have chosen Arizona as their home. Under Governor Ducey’s leadership, we have seen the Arizona Department of Transportation (ADOT) work directly to make our borders safer and more efficient. New inspection procedures by ADOT enforcement along with the historic CBP Unified Cargo Processing program that was first tested and perfected in Arizona, have resulted in a border that is second to none. Our border wait times have dropped dramatically. While ports of entry in Texas, New Mexico and California measure the truck crossing times in hours, Arizona’s are measured in minutes! And we are not done yet. Arizona continues to push the envelope to support other key industries for Arizona’s economy such as Tourism, with new binational initiatives such as the implementation of a safety corridor for travelers from the Arizona-Mexico border to the beaches at Rocky Point (Puerto Peñasco). This is a direct result of a joint agreement signed by Governor Ducey and Sonora Governor Claudia Pavlovich, implemented by ADOT, the Arizona-Mexico Commission and their Sonoran counterparts. Certainly several challenges remain, such as the need to modernize our border infrastructure, secure additional staffing for Customs and Border Protection at the border and continued promotion of the Arizona-Mexico corridor as a preferred alternative for products destined to the west coast. And we must remember that our corridor works in both directions, affording new business opportunities for Arizona and U.S. companies that are looking at Mexico as a market of opportunity for their goods and services. But it’s these challenges that drive Arizona’s collaborative and entrepreneurial spirit and what will help Arizona continue to lead an increasingly connected 21st century economy. 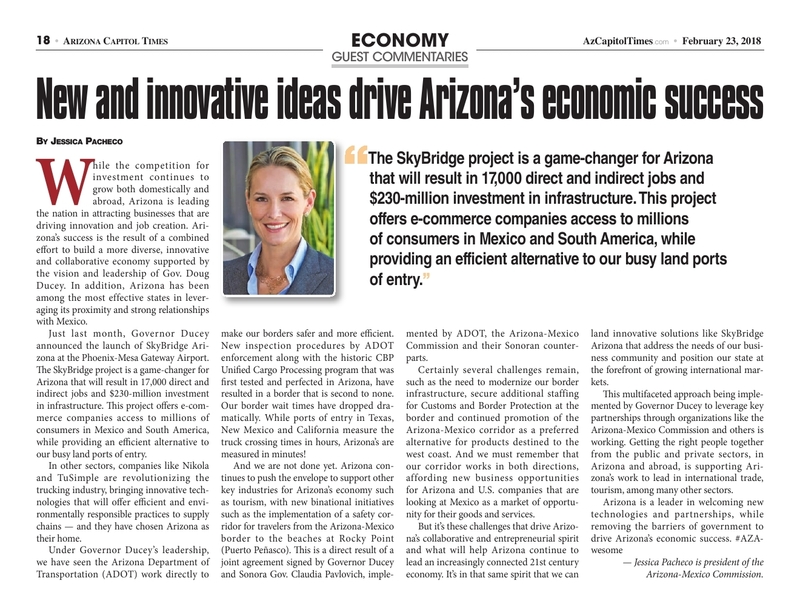 It’s in that same spirit that we can land innovative solutions like SkyBridge Arizona that address the needs of our business community and position our state at the forefront of growing international markets. This multifaceted approach being implemented by Governor Ducey to leverage key partnerships through organizations like the Arizona-Mexico Commission and others is working. Getting the right people together from the public and private sectors, in Arizona and abroad, is supporting Arizona’s work to lead in international trade, tourism, among many other sectors. The Arizona-Mexico Commission is Arizona’s premier cross-border nonprofit organization. The Arizona-Mexico Commission's mission is to improve the economic prosperity and quality of life for all Arizonans through strong, public/private collaborations in advocacy, trade, networking and information. For more information about the Arizona-Mexico Commission visit www.azmc.org.